The title card from the pilot. Blue's Clues is a American animated/live action children's TV show that aired on Nick Jr. from 1996 to 2006 and was nominated for nine Emmy awards in children's programming during its run. The show spent many years in development, with the show's writers experimenting around with different ideas. 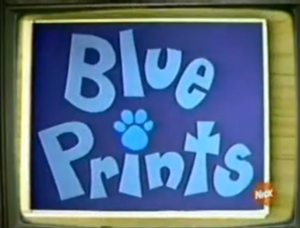 One result of these experiments was the unaired 1995 test pilot created with the working title, Blue Prints. The pilot was only shown to a few preschoolers as a way to test out the show's interactive elements and formulas. According to reports, the children ate it up, but there were several changes that needed to be made. 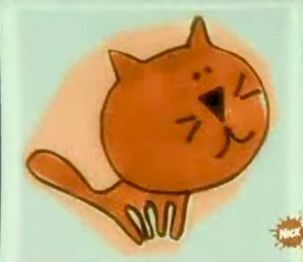 Blue was originally going to be a cat named Mr. Orange, and later, Mr. Blue. Mr. Salt also had a Brooklyn accent as a contrast to the French accent he was ultimately given. Steve also sported a red shirt instead of his signature green stripes. The pilot was obscure, and mostly unknown until 2006 when Nickelodeon aired a 10-year anniversary special detailing the history of the show. A few very short clips of the pilot were shown, and the crew members commented on it. After the airing, fans of the series scoured online resources, including bootlegs, torrents, and file-sharing sites to no avail. Nickelodeon has yet to release the episode, as they felt it was too different from the rest of the series.